COMFY & HYPOALLERGENIC - Quilted hypoallergenic filling offers added softness and comfort for infants and toddlers. Soft cotton poly blend knit top provides coziness on babys mattress. SECURE FITTED DESIGN - SecureStay full fitted stretch skirt helps prevent sliding and shifting for extra security. Snuggly fits USA standard full-size crib mattresses and toddler bed mattresses. 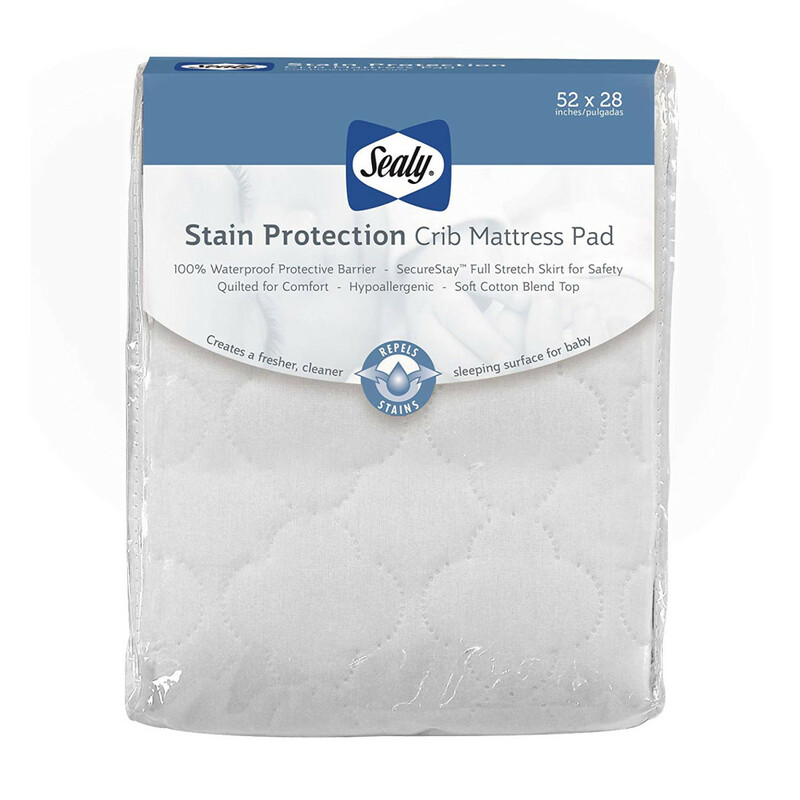 Create a fresher and cleaner sleeping surface for infants and toddlers with the Sealy Stain Protection Crib Mattress Protector- enhanced with stain repel and release technology! 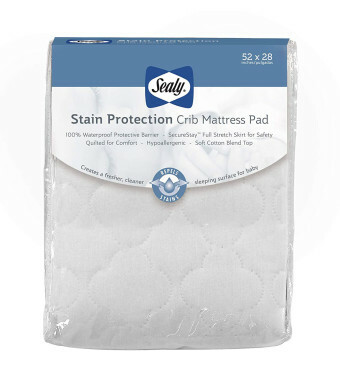 The innovative stain protection finish helps prevent stains on babys mattress and allows stains, odors and germs to easily wash away for a more sanitary environment. Plus, a PVC-free 100% waterproof barrier offers added protection from leaky messes and spills and this crib pad is machine washable and dryer friendly. The soft knit cotton blend top provides cozy comfort for baby, while the hypoallergenic quilted cushioning offers an added layer of softness. A high quality SecureStay skirt wraps snuggly under babys mattress for a safe, secure fit. Measures 52 x 28 with a premium 8.5 fitted stretch skirt to fit USA standard infant and toddler bed mattresses. Sealy Stain Protection Crib Mattress Pad fits standard crib mattresses and toddler beds. The quilted top provides added comfort and softness for your baby. The deep pocketed cotton blend skirt prevents sliding and shifting. This is 100% waterproof to protect your mattress and is machine washable and dryable.